AHMEDABAD, India, May 24 2017 (IPS) – Developing Africa’s ‘grey matter infrastructure’ through multi-sector investments in nutrition has been identified as a game changer for Africa’s sustainable development. Experts here at the 2017 African Development Bank’s Annual Meetings say investing in physical infrastructure alone cannot help Africa to move forward without building brainpower. “We can repair a bridge, we know how to do that, we can fix a port, we know how to do it, we can fix a rail, we know how to do that, but we don’t know how to fix brain cells once they are gone, that’s why we need to change our approach to dealing with nutrition matters in Africa,” said AfDB President, Akinwumi Adesina, pointing out that stunting alone costs Africa 25 billion dollars annually. Malnutrition – the cause of half of child deaths worldwide – continues to rob generations of Africans of the chance to grow to their full physical and cognitive potential, hugely impacting not only health outcomes, but also economic development. Malnutrition is unacceptably high on the continent, with 58 million or 36 percent of children under the age of five chronically undernourished (suffering from stunting)—and in some countries, as many as one out of every two children suffer from stunting. The effects of stunting are irreversible, impacting the ability of children’s bodies and brains to grow to their full potential. On a panel discussion Developing Africa’s Grey Matter Infrastructure: Addressing Africa’s Nutrition Challenges” moderated by IFPRI’s Rajul Pandya-Lorch, experts highlighted the importance of urgently fighting the scourge of malnutrition. The idea is to get everyone involved and not leave nutrition to agriculture and/or health ministries alone. And panelists established that there is indeed a direct link between productivity and growth of the agriculture sector and improved nutrition. Baffour Agyeman of the John Kuffuor Foundation puts it simply: “It has become evident that it is the quality of food and not the quantity thereof that is more important,” calling for awareness not to end at high level conferences but get to the grassroots. 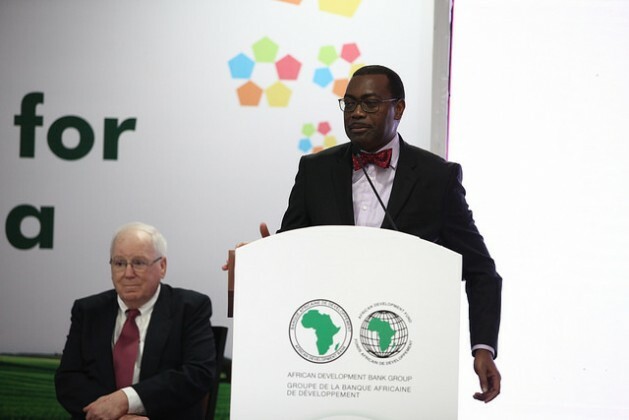 Assisting African governments to build strong and robust economies is accordingly a key priority for the AfDB. But recognizing the potential that exists in the continent’s vast human capital, the bank included nutrition as a focus area under its five operational priorities – the High 5s. And to mobilise support at the highest level, the African Leaders for Nutrition (ALN) initiative was launched last year, bringing together Heads of State committed to ending malnutrition in their countries. As a key partner of this initiative, the Bill and Melinda Gates Foundation foresees improved accountability with such an initiative in place. “ALN is a way to make the fight against malnutrition a central development issue that Ministers of Finance and Heads of State take seriously and hold all sectors accountable for,” said Shawn Baker, Nutrition Director at the Foundation. Notwithstanding the overarching theme of Africa rising, Muhammad Ali Pate, CEO of Big Win Philanthropy, says, “We can’t say Africa is rising when half of our children are stunted.” He pointed out the need to close the mismatch between the continent’s sustained GDP growth and improved livelihood of its people. With the agreed global SDG agenda, Gerda Verburg, Scaling Up Nutrition Movement Coordinator sees nutrition as a core of achieving the goals. “Without better nutrition you will not end poverty, without better nutrition you will not end gender inequality, without better nutrition you will not improve health, find innovative approaches, or peace and stability, better nutrition is the core,” she says. Therefore, developing Grey Matter Infrastructure is key to improving the quality of life for the people of Africa. But it won’t happen without leadership to encourage investments in agriculture and nutrition, and more importantly, resource mobilization for this purpose.